De-risking Seismic Amplitude Interpretation by 3D Seismic Volume Detuning Amplitude maps extracted as horizon attributes from 3D seismic are important tools in exploration, appraisal and field development in many geological environments around the world. Geophysics and rock physics help us to relate seismic amplitude maps to many physical properties important in exploration and production, including changes in lithology, porosity and the presence of hydrocarbons, especially gas. However, amplitudes derived from seismic data are also affected by tuning, whereby the amplitude also responds to reservoir thickness changes independently of any lateral property change in the reservoir properties. Thickness related tuning can easily double amplitudes in seismic, often being the cause of significant reflector brightening in seismic data. By comparison, even a very strong gas saturation effect in a soft sand reservoir may only change amplitudes by 25%. Thickness related tuning is well understood in geophysics, but the basic principle of removing tuning effects from amplitude maps is not widely applied. Detuned amplitudes can also be used for computing seismic net pay. However, published methods are based on detuning of maps extracted from seismic. A new and novel technique has been developed which directly detunes the 3D seismic traces themselves. The advantages of direct detuning of 3D seismic volumes include the ability to investigate the whole trace amplitude response (not just a window or extraction), generation of tuning curves without seismic data picking, rapid updating and modification of parameters and improved stratigraphic and quantitative interpretation. 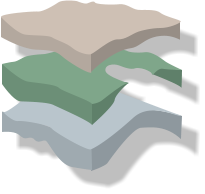 The method is demonstrated on several real world datasets and results from a number of different geological scenarios are highlighted. These include detuning the seismic response from a UKCS Southern Gas Basin Rotliegend/Carboniferous target and a CNS target which includes Jurassic, Zechstein and Rotliegend reservoir intervals. A contrasting example from the Sea Lion Field, North Falkland Islands Basin will also be shown. 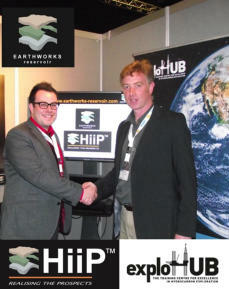 Earthworks Reservoir has entered into an agreement with the University of Aberdeen’s ExploHUB training centre for the provision of its revolutionary prospect evaluation software HIIP™. In doing so Earthworks Reservoir identifies the importance of training tomorrow’s exploration geoscientists and recognises the value of introducing trainees to industry standard software, technologies and capabilities as they embark on their future careers. Earthworks is an international provider of software and services for subsurface reservoir description. Earthworks provides specialised expertise to the oil and gas industry in geophysics and geostatistics. Centred on geological and geophysical sub-surface description, Earthworks provides workflows on all stages of hydrocarbon asset life cycles from exploration through appraisal, development and production, including production geophysics and reservoir modelling. Why not join us on LinkedIn, Facebook and twitter for all the latest news and information. 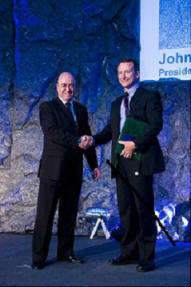 Earthworks are extremely proud that Ashley Francis (Managing Director) was the recipient of this year’s Nigel Anstey award. This prestigious recognition by the EAGE highlights the technical contribution Ashley has made to the industry with regard to Earthworks' Inversion methods. The Nigel Anstey Award is presented for "a contribution of distinctly valuable and tangible bearing on one or more of the disciplines in our (EAGE) association." The EAGE presented this award to Ashley "in recognition of his very substantial, original and diverse contribution to seismic inversion and geostatistics, and to the quantifying of uncertainty and risk. He has been a major influence for the widespread adoption of stochastic inversion technology in practical reservoir characterisation work. His extensive publications - especially his two papers in First Break - and lectures have helped considerably to publicise and also to demystify stochastic modelling, and to move it into the realm of an everyday tool in geological modelling. Thanks to the successful launch of his company Earthworks, he has successfully developed high speed stochastic inversion software to allow the rapid commercial application of the technique. Ashley Francis' other technical contributions, and his active participation in conferences define him as a geoscientist who has made a very major contribution to geoscience over more than two decades."